Product prices and availability are accurate as of 2019-04-14 11:49:03 UTC and are subject to change. Any price and availability information displayed on http://www.amazon.com/ at the time of purchase will apply to the purchase of this product. a once daily soft gel designed specifically for the hair, skin and nails. 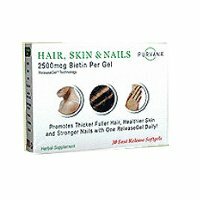 With 2500 mcg of Biotin per gel, purvana supports the healthy growth of tissues from the inside out. The amazing part is that customers only need to take a single soft gel daily.